It is best for your child to be placed among other dancers of the same ability. Therefore all class placements may be altered during the month of September. For the 2018-19 season, all placements will be finalized by September 30, 2018. Ballet is the cornerstone of all formal dance disciplines. We recommend ballet be a priority in your schedule to enhance your child’s technique in either competitive or recreational dance. 1-2 ballet technique classes depending on ballet grade level. Minimum 1 ballet technique class for participation in Ukrainian (at Grade 1 Ukrainian and over) and tap. 2 ballet technique classes. Minimum 1 ballet technique class for participation in Ukrainian and tap. 2 ballet technique classes and pre-pointe class where applicable. 2-3 ballet technique classes and pointe. We invite you to observe your child’s progress via our large viewing windows, as well as your child’s entire class(es), 2018-19 season dates you will find in our calendar. Correct rehearsal wear enables Instructors to see the dancers’ bodies clearly so corrections to alignment and placement may be made, and injuries avoided. Dancers are also encouraged to retain a class binder to compile choreography or exam notes, newsletters and other handouts. Parents should ensure that children are brought to class on time, and picked up promptly after class is over. Please also help us maintain our studios in clean condition by removing footwear at the front door. In view of higher technical expectations in the competitive program, student agreements outlining class attendance and expectations may be utilized. Regular attendance is essential for the individual student’s and classmates’ success. Students are expected to be dressed and ready at least five (5) minutes before their class time. If a student is going to be absent from rehearsal, the Studio should be notified at least one (1) hour prior to the start of the class (please provide an e-mail or leave a telephone message as appropriate). Students with injuries or slight illnesses are requested to attend to watch class. Attendance at performances is mandatory. If you anticipate difficulty attending a scheduled performance, please notify your Instructor ahead of time so alternative plans (such as carpooling) may be made. Classes will be held regularly except where occurring over Christmas or Spring break. In the event a class is cancelled by necessity a make-up class will be offered. There is no refund for missed classes except in the event of prolonged absence due to illness or injury, supported by a doctor’s note. We offer a blend of non-competitive and (for 6 year and over dancers) competitive performance opportunities. 3 – 5 Spring season performances (depending on age/level) including year-end recital. Festival program participants are scheduled in 2 festival format events along with year-end recital. Number of performances increases with age and for those students enrolled in competitive classes. Entry fees for festivals/competitions vary and are announced in November of each dance season. There is no fee associated with any non-competition or festival format performances. A schedule of performance dates and locations will be released over the course of the 2018-19 season. All students are provided opportunity to participate in year-end recital. 2017-18 season recitals are scheduled June 6-8, 2018 at Festival Place, Sherwood Park. 2018-19 season recitals are scheduled June 12-14, 2018 also at Festival Place, Sherwood Park. 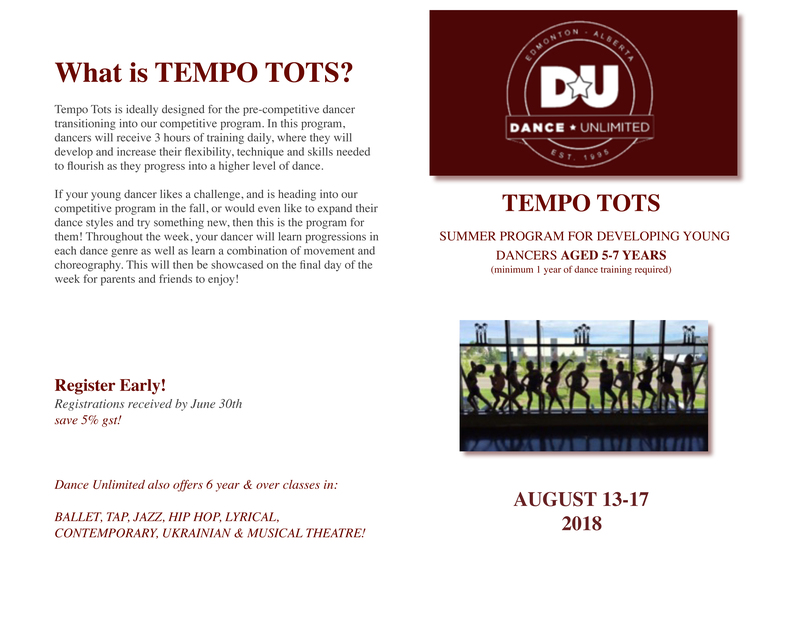 Dance Unlimited attempts to schedule family members on the same recital date to the best of its ability. Competitive program students at Jr. level and over are typically scheduled on more than one recital date. 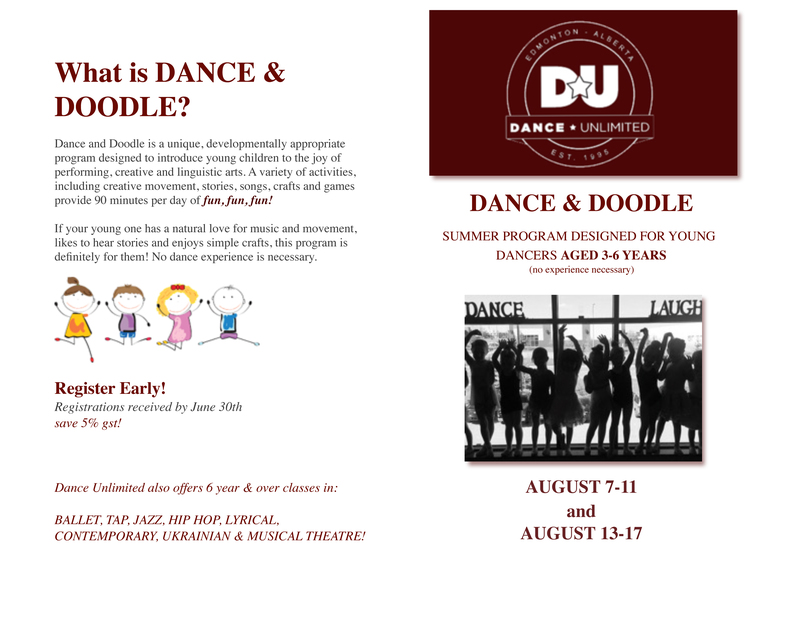 Dancers aged 6 years & over are encouraged to learn an additional routine/routines outside of regular class time. 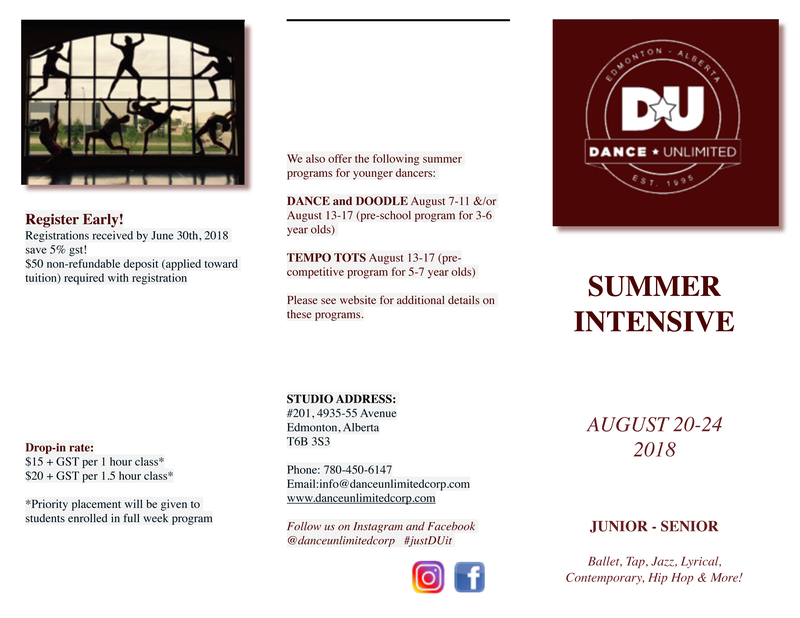 Registrations for solo/duet or extra group routines are accepted via internal studio communication and bulletin board sign-up. (Participation in minimum one ballet technique class – depending on level – is strongly recommended.) 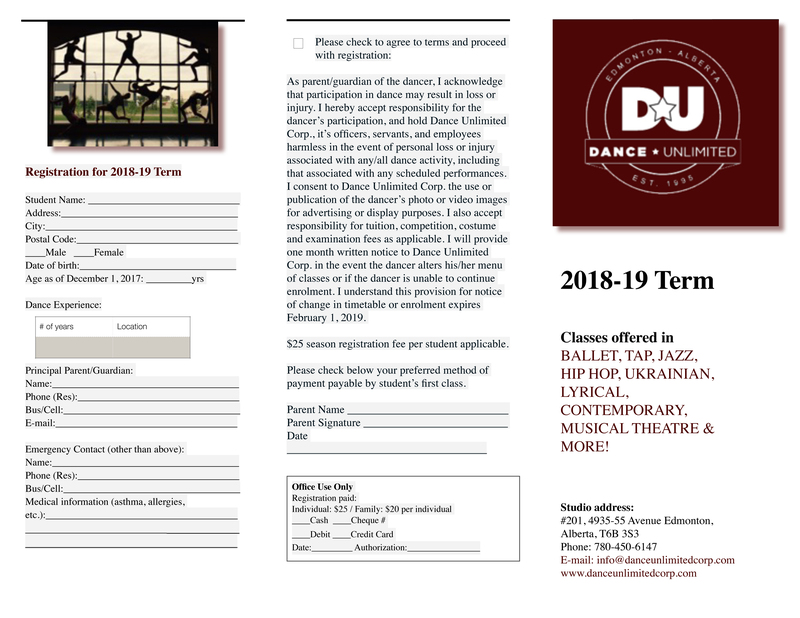 It is the dancers’/parents’ responsibility to ensure a festival/competition confirmation (one per applicant) is received by the DU office by the stated deadline in order for the routine/routines to be entered into Spring festivals or competitions. For cost savings, dancers are encouraged to wear used costumes for extra routines where appropriate. Photo samples of previous years’ costumes, which may be available for re-sale or rent, are located in the Dance Unlimited Yearbooks. Additional photo samples are held on file at the DU office. Please consult your Instructor regarding costume selection prior to purchase. We offer regular communication to update you on all Dance Unlimited activities. Please retain all newsletters and bulletins for ongoing referral. Please also acquaint yourself with our mailbox system, located in the studio lobby, and check your personal family file folder regularly. We provide the majority of our communications via e-mail, as well as our hard copy ‘family folder’ system and bulletin board postings. The studio offers dancer/parent contact information for internal purposes. Please notify us if you require your parent/guardian telephone, e-mail or mailing address held in confidence.